Oregon Ballet Theatre is seeking professional classical dancers to fill positions at all levels within the company for the exciting 2019/2020 Season. OBT’s repertory includes classical full-length ballets and repertory productions featuring new and iconic works from Resident Choreographer Nicolo Fonte in addition to well-known artists such as Nacho Duato, William Forsythe, & Jiří Kylián. OBT is a member of AGMA and offers dancers competitive salary plus benefits and a minimum contract of (at least) 32 weeks. 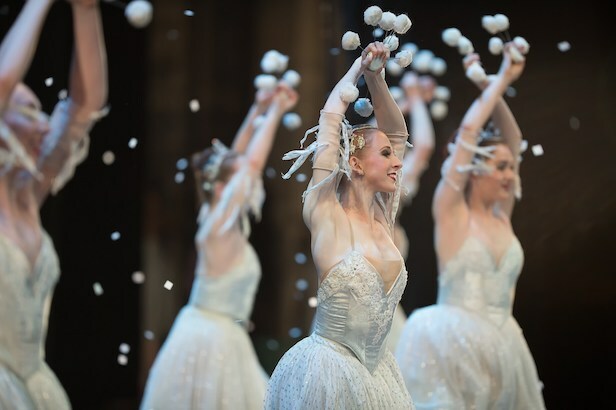 Jessica Lind and OBT dancers as snow in Oregon Ballet Theatre’s 2017 production of George Balanchine’s The Nutcracker. A rare dancer whose career spanned multiple disciplines, Kevin Irving began dancing with jazz classes in his hometown dance school (Long Island, New York), before joining the school and training ensemble of Alvin Ailey – an experience that impacted him deeply. From 1982-1985, he danced with The Elisa Monte Dance Company of New York, a company often referred to as “post-modern.” At 24, however, he took a sharp turn toward classical dance, joining Les Grands Ballets Canadiens in Montréal. Promoted to soloist and principal, Irving became a well-known figure wherever LGBC performed, excelling in classical, neoclassical, and contemporary roles – including roles and ballets created by LGBC’s resident choreographer, James Kudelka. In 1993, Irving joined Twyla Tharp Dance, touring the U.S. and Europe with the acclaimed choreographer, including performances at L’Opéra de Paris, and the PBS filming of Tharp’s much-lauded ballet In the Upper Room. From 1994-2002, Irving was ballet master and associate director with Nacho Duato’s Compañía Nacional de Danza in Madrid. From 2002-2007, he served as artistic director of The Göteborg Ballet in Sweden. The company, during Irving’s tenure, was named the most important dance company in Sweden in Ballet International’s critic poll. From 2007-2013, Irving was a frequent guest ballet master with The Royal Danish Ballet, where he staged and rehearsed works by Jiří Kylián, George Balanchine, and Jerome Robbins. He has also been a guest teacher with numerous companies and schools in the U.S. and abroad for over 20 years. Additionally, he staged ballets by Nacho Duato and Nicolo Fonte for companies such as The Royal Ballet Covent Garden, Nederlands Dans Theater, Hubbard Street Dance Chicago, Lyon Opera Ballet, and The Australian Ballet, to name just a few. In the U.S., Irving became associate director at Morphoses (formerly The Wheeldon Company) from 2011-2012, coordinating special initiatives aimed at defining the company’s unique profile in the dance world. In 2010, he founded I-DANCE (Inspiring Dance: American Nations’ Choreographic Exchange), a nonprofit that sends teachers and choreographers to dance communities in Central and South America. Irving was named artistic director of Oregon Ballet Theatre in July 2013. Michael Greer brings leadership experience from both for-profit and nonprofit worlds. Most recently, he led an arts nonprofit through a successful transition; previously, he led China side operations, projects, and sales teams for multinational companies. A native of Missouri, Greer spent the early part of his life as a dancer at the world’s most prestigious institutions: Interlochen Arts Academy, School of American Ballet, San Francisco Ballet School, and The Royal Ballet School. Upon completing his training, he danced professionally with Ballet West in Salt Lake City, Utah, under the direction of Jonas Kage. After retiring from performing, Greer completed an economics degree with an emphasis in industrial organization – as an Arturo Schomburg Scholar at Hampshire College in Amherst, Massachusetts. He was offered a merit scholarship to continue economics at Stanford University but declined – to gain international business experience as a Gilman Scholar through the U.S. State Department. Greer then worked with companies in India and China for nine years; he managed teams and operations for several multinational corporations. A Mandarin speaker, he fully enjoyed life in China with his wife and two children. In 2015, Greer returned to the U.S. and the dance world, to direct Portland Ballet in Portland, Maine. Combining considerable business experience with his passion for the arts, he worked to increase earned and contributed revenue, which resulted in Portland Ballet’s major turnaround. Now, Greer and his family are thrilled to be a part of the Portland, Oregon community. OBT is committed to sharing its passion for the expressive power of ballet, inspiring an enduring appreciation of dance, and connecting in meaningful ways to our community through excellence in performance, training, and education. Peter Franc as Cavalier and Kelsie Nobriga as Sugarplum Fairy in Oregon Ballet Theatre’s 2017 production of George Balanchine’s The Nutcracker. OBT is the largest professional ballet company in Oregon; we employ nearly 200 people and attract artists from around the globe through our reputation for excellence. The company is rooted in classical ballet traditions, with a repertoire ranging from the classics to premieres from today’s most exciting choreographic voices. Our mission is dedicated to the vitality of – and access to – world-class ballet performance and training in the Pacific Northwest. Founded in 1989 by James Canfield, a former principal dancer with the Joffrey Ballet, OBT developed a distinct style and unique repertoire that comprised over 80 ballets. From 2003-2012, under the direction of Christopher Stowell, OBT presented nearly 350 performances and added 51 ballets – including 20 world premieres – to its diverse body of work. In June 2013, the OBT Board named Kevin Irving as the company’s third Artistic Director. Irving brings over 25 years of experience performing with and managing world-renowned cultural organizations and dance companies, including The Göteborg Ballet, The Royal Danish Ballet, and Compañía Nacional de Danza. Irving’s tenure is marked by a commitment to collaborative partnerships with Portland artists and organizations, including the Portland Art Museum, Multnomah County Library, Kenji Bunch, and Pink Martini. He is expanding the company’s classical repertoire with premieres of Ben Stevenson’s Cinderella and his own updated Swan Lake while preserving OBT’s legacy by restoring major works such as James Canfield’s Romeo & Juliet. Irving is diversifying our repertoire with world premieres from internationally-acclaimed and contemporary choreographers: Nacho Duato, William Forsythe, Nicolo Fonte, Darrell Grand Moultrie, and Helen Pickett. OBT’s investment in the community extends far beyond our stages and studios, as we enrich the community and invest in our art form. We provide ballet training to over 800 students through the OBT School, which attracts dancers as far away as Spain and Japan – and through our junior company OBT2. OBT2 provides rigorous training and performance experience to facilitate the transition from student to professional dancer in a small, nurturing environment. OBT2 is led by Program Director Lisa Sundstrom, within guidelines established by both OBT’s Artistic Director Kevin Irving, and the Director of the School of OBT Marion Tonner. OBT2 dancers participate in daily technique, pointe class, men’s class, strength and conditioning, pas de deux, and flexibility training. Dancers take class with OBT’s professional company on certain days of the week, and perform for the community at large and underserved audiences throughout Portland. OBT’s investment in the community extends far beyond our stages and studios, through a wealth of free and low-cost programs that unlock the world of ballet for learners of all ages and backgrounds. Our comprehensive OBT Outreach reaches approximately 35,000 people annually, including over 11,000 K-12 students across 22 school districts, and includes: Performance Perspectives pre-show presentations; our popular Student Performance Series; special access to our dancers through Photo/Art Encounter; and front-row seating and audio narration at Nutcracker dress rehearsals for hundreds of low vision and hearing-impaired children and their families. Our in-school residencies are designed to integrate seamlessly with academic curriculum, and the majority of our youth programs serve schools with over 50% Free and Reduced Rate Lunch (FRRL) participation. Photo (above) by Yi Yin: OBT School student as an angel in Oregon Ballet Theatre’s 2017 production of George Balanchine’s The Nutcracker.